Care2 Healthy Living | Want to Find or Sell Foraged Foods? There's an App for That. Want to Find or Sell Foraged Foods? There’s an App for That. A new urban foraging app – RipeNearMe – is aiming to take urban foraging to the next level by letting growers share, swap, or even sell their bounty. 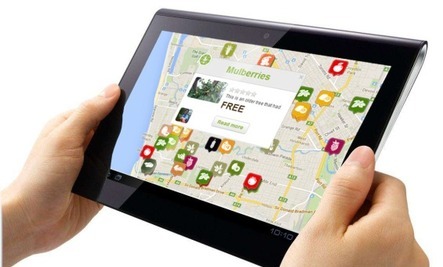 Crowdsourced apps that encourage urban foraging are nothing new. What makes RipeNearMe special is the ability to tell folks how you’d like to interact with foragers. What if you could trade the mulberries on your over-producing tree for blueberries from a neighbor? Or sell those extra muscadines, and treat yourself to a fancy coffee? By allowing people to do more than just offer their locally-grown food for free, the folks at RipeNearMe want to encourage more people to plant edibles in urban spaces. Because let’s face it: money talks. RipeNearMe is an Australian-based app, and they want to expand their database to include urban fruit growing all over the world. Check out the video at the top of the page to hear all about how it works. The RipeNearMe app has been nominated as a finalist in the OuiShareFest Awards and semi-finalists in the AppMyCity contest to be held in Dallas next month. Unfortunately, building and maintaining awesome software and spreading the word about it isn’t free. RipeNearMe is a labor of love, and if this app is going to continue to grow the creators need a bit of extra funding. That’s where you come in! The RipeNearMe team kicked off a crowdfunding campaign last week. If you like what they’re doing, throw some cash their way! Let’s hear from the urban foragers out there! How do you find fruits, vegetables, and herbs? Are you using a map? An app? Tell us in the comments! Local foraging also means that flora that is already struggling in ever-shrinking space is pushed to the brink of extinction. For example, ramps are being wiped out because too many people are taking too much. If you do decide to try foraging, please do some research first so that you aren't just as bad as a poacher.